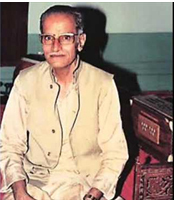 Ratnakar Pai was a doyen of the Jaipur-Atrauli gharana. He was an exemplary scholar and a teacher. He lived and taught in Mumbai till his death. He received his training from two stalwarts of the gharana – Mohanrao Palekar, who was a disciple of Ahmed Khan (Alladiya Khan’s nephew and Jahangir Khan’s grandson) and Bhurji Khan, and Gulubhai Jasdanwalla, who learnt from Manji Khan and subsequently from Alladiya Khan himself. Paibuwa was regarded as one of the foremost authorities of the Jaipur-Atrauli tradition and his singing is regarded as one of the purest expressions of the gharana’s gayaki. He was endowed with a richly resonant voice and his singing was taan-pradhaan (true to gharana tradition). He held a mastery over laya and tala (noted by Babanrao Haldaknar in his book, Aesthetics of Agra and Jaipur Traditions) and a balance of melody tightly woven with the rhythm can be observed in his singing. He had a large repertoire of rare bandishes and ragas which he generously passed down to his disciples. Though he did not have a full-fledged performing career, he was an ace teacher having trained numerous singers. His list of disciples includes Jitendra Abhisheki, Bhalchandra Tilak, Milind Malshe, Narendra Kanekar, Ashwini Bhide-Deshpande, Shalmalee Joshi and Aditya Khandwe. Aesthetics of Agra and Jaipur Traditions by Shrikrishna (Babanrao) Haldankar.